White plague, consumption, or in modern terms tuberculosis, has been around since antiquity and has been found as Pott’s disease (tuberculosis that affects the vertebrae) in the mummies of ancient Egypt. A face was given to the perpetrator of this debilitating, wasting disease when German scientist and physician Robert Koch discovered the bacterium Mycobacterium tuberculosis in 1882. Even today the battle against tuberculosis rages with WHO reporting it to be one of the top ten causes of death throughout the world. In 2015, while 10.4 million people became ill with TB, 1.8 million lost their lives because of it (WHO). India accounts for 23 percent of the people who became ill with the disease, above Indonesia and China with 10 percent each in 2015, despite tuberculosis being a preventable and curable disease. Certainly the problem is a monumental one and ending the TB epidemic by 2030 has been rightly categorised as one of the health objectives of the UN’s Sustainable Development Goals. In India, four lakh people die from TB every year and most of its victims are women. 40 percent of Indians are infected with TB. The most affected age group is the economically productive one from 15-55 years of age, and therefore it causes immense economic stress. Although Indians are given the BCG (Bacillus Calmette-Guerin) vaccine, named after the French scientists Albert Calmette and Camille Guerin who developed it, it is not always a fool-proof solution. About one third of the world’s population is presumed to be infected with TB, but they do not always display the symptoms. This is called latent tuberculosis and it does not make the infected individual a threat to others. The most likely causes of latent tuberculosis turning into active tuberculosis would be lowered immunity due to HIV/AIDS, heavy smoking, malnutrition, diabetes, etc. TB tops the list as the killer of people who are HIV positive. 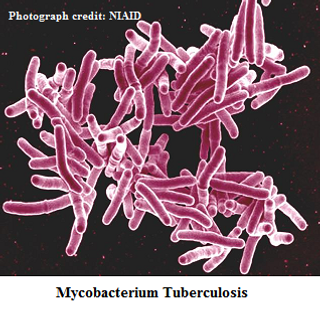 TB of the lungs (pulmonary tuberculosis) can spread quite easily and is highly infectious. This happens when the actively infected individual coughs or sneezes and in doing so releases a spray of tiny droplets carrying the infection. People who inhale the droplets will become infected. A person with an active infection spitting and talking can also contribute to the spread of TB. Poor ventilation and crowded areas make for excellent means for the spread of the bacteria. The symptoms of pulmonary TB include: coughing for two weeks or more, rise of body temperature in the evenings, weight loss, loss of appetite, chest pain, pallor due to anaemia, and sputum that is blood streaked. Extra-pulmonary TB is when an organ or tissues other than the lungs is infected. Usually the infection begins in the lungs, but the bacteria can move to other organs if the body’s immunity level is low. The symptoms vary depending on the organ/s infected. In the case of the lymph glands, one may experience swelling of glands, most visible in the neck, armpits and groin. An affected heart will cause inflammation of the heart, chest pain and shortness of breath. In the stomach, tuberculosis can cause pain, swelling, indigestion with diarrhoea and weight loss. TB of the bones and joints brings swelling and pain to those areas. If one’s bladder or kidneys are affected then there will be pain in the loin or while passing urine. Skin rashes occur in TB of the skin. When TB affects the brain and spinal cord, meningitis develops with nausea, vomiting, convulsions, headaches, change in behaviour, etc. Multiple organs may become infected, and tuberculosis can spread through one’s entire body if left unchecked. Avail of high quality, free treatment with full information about the drugs and available healthcare services. Have the right to have your condition kept confidential and your culture and religious beliefs respected. Refuse an operation if medical treatment is possible. Inform healthcare staff about your condition and about contact with family, friends, etc. Follow the prescribed treatment plan and make any difficulties in following it known to healthcare staff. If TB is suspected then a sputum examination must be done by sending two samples of the sputum to a government hospital or microscopy centre. 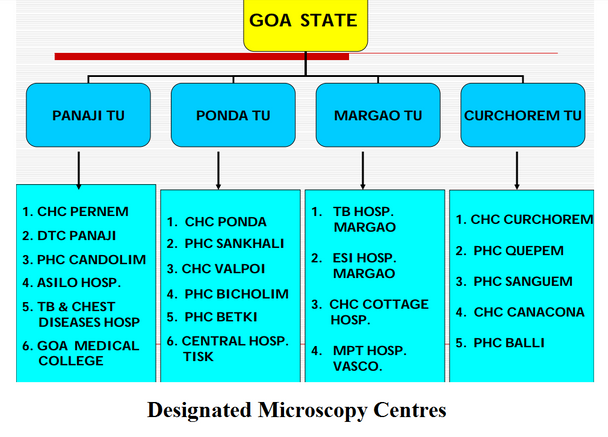 In Goa, the sputum examination can be done free of cost at any one of the 21 designated microscopy centres. Other appropriate diagnostic measures are applied to confirm extra-pulmonary TB. The DOTS (Directly Observed Treatment, Short-course) strategy is utilised by the Revised National Tuberculosis Control Programme (RNTCP) in India to curb this epidemic of TB. Here the patient has to take the medication in the presence of the health worker or DOT provider, thus ensuring that the patient takes medication on a regular basis and completes the course. There are two phases to DOTS. The intensive phase covers two to three months, where the health worker watches the patient swallow the pills three times a week. The continuation phase is spread over four to five months. Each week the patient is given a multi-dose blister pack of the medication and the first dose of the week is taken in front of the health worker. Clinical trials have shown that thrice a week alternate day treatment is as efficacious as daily treatment. DOTS reduces the dosage and duration of treatment because of the standardised drug regime. This treatment for TB is free and available at all health centres and hospitals. Pregnant and breastfeeding women should inform doctors of their status before proceeding with the medication. Patients suffering from HIV/AIDS or any other immunity lowering illness should make their doctors aware of the disease while seeking treatment for TB because only the doctors can decide which the best combination of drugs is for both diseases to avoid detrimental reactions. The TB treatment can cause side effects such as nausea, vomiting, orange or red urine, tears, saliva, or stomach aches. Doctors will advise on how to cope with these. Any tingling in the toes and fingers, blurring vision, cramps or yellowing of the skin should be reported to the doctor. It is essential to complete the course of medication for TB because multidrug-resistant TB (MDR-TB) can develop. The drugs for this type of TB are expensive and have more side effects. If drugs for MDR-TB are also not taken properly, the TB strain will become resistant to most drugs available bringing, about extensively drug-resistant TB (XDR-TB). Very few cases of XDR-TB have been successfully treated. Even if you do not have the illness, as a responsible citizen who wants to save India from this scourge of TB, it is one’s duty to share this information and encourage people who have the symptoms to take the TB test. You can also become a DOT provider in your neighbourhood and urge TB patients to seek treatment at the earliest and complete their course of treatment.